We’re not told how many men came. 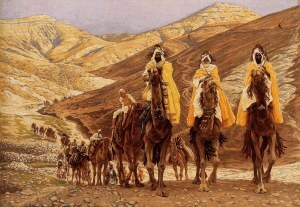 We know they carried treasures of gold, frankincense and myrrh. They were men of science who studied the stars. They followed the star of Bethlehem which indicated to them that a king had been born. It took as long as two years to reach their destination. When they arrived in Jerusalem they went straight to Herod and asked where they could find this new king. Herod set the next scene into motion by asking for directions to see the child so he could worship Him too. What this evil man was mulling over in his mind was the elimination of all firstborn sons in Jerusalem who were two years old or less. This entry was posted in Uncategorized on December 16, 2015 by Pastor Jim Driskell, Lutheran Church.